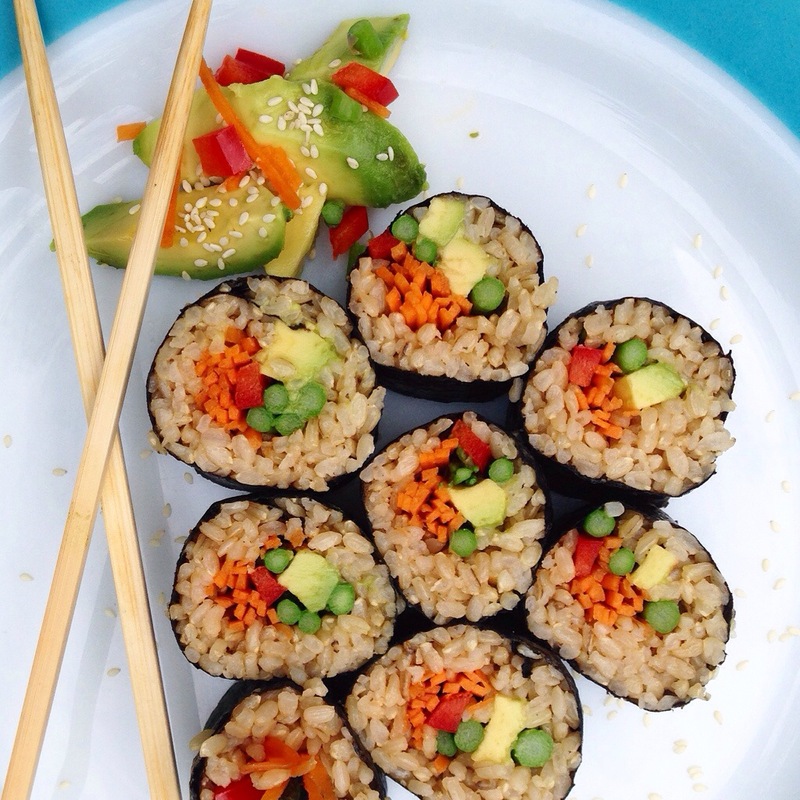 Brown Rice & Veggie Sushi. | Eat More Plants. 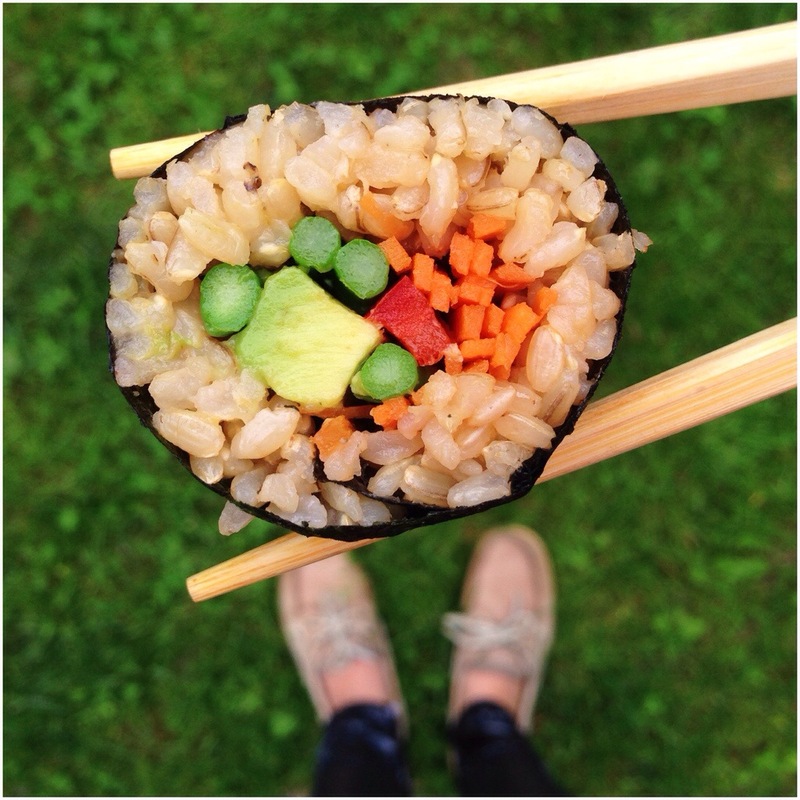 Brown Rice & Veggie Sushi. I’m always so proud of myself when I slice my sushi rolls and I see a beautiful little vegetable rainbow. No fancy ingredients or equipment needed. Mind you, it does take practice to get the hang of rolling neatly but it’s doable. Bring water and 1 teaspoon tamari to a gentle boil. Add rice and turn heat down to medium while stirring for 30 seconds. Cook for 35-40 minutes or until all the water has evaporated. Remove from heat, fluff and leave covered for 10 minutes to cool. Scoop rice into a non-reactive bowl (glass, wooden or ceramic). Add remaining 1 teaspoon of tamari and rice vinegar. Let sit out for 15 minutes to cool completely. In the meanwhile, prepare your nori and filling. Toast your nori by waving it back and forth over a stove burner (or using a lighter) until it turns slightly green, about 5-10 seconds. Julienne your veggies: cucumber, radish, bell pepper, carrot, summer squash or green onions. Have a little bowl of room temperature water at your workspace. 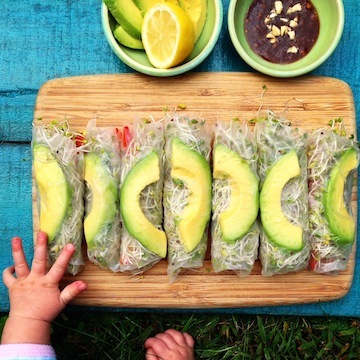 Lay a piece of wax paper, a little bit bigger than your nori, on a clean, dry, flat surface. Lay the nori, shiny side down. 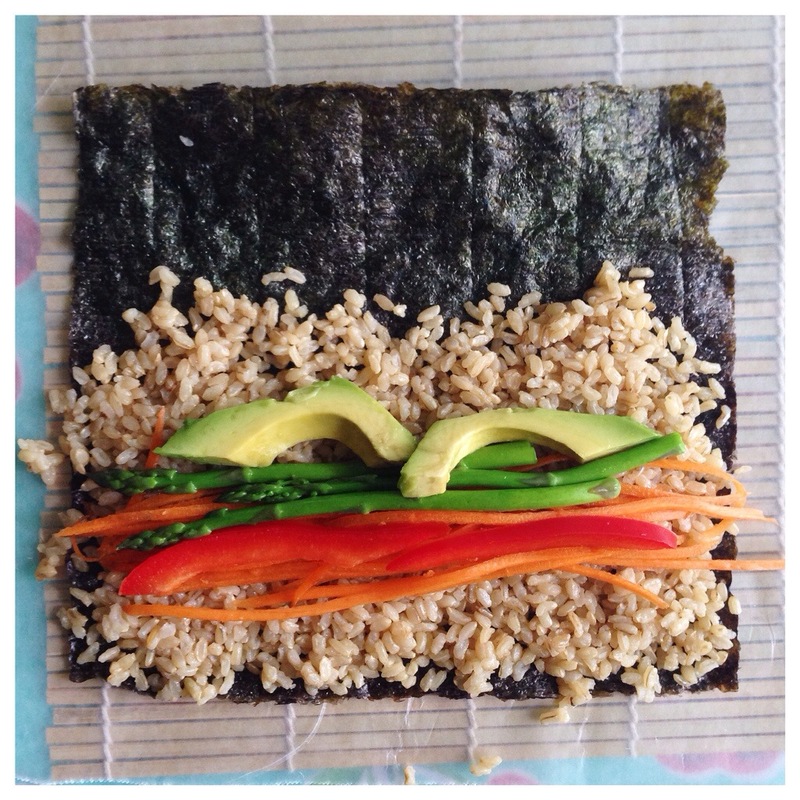 Using wet fingers, press a layer of rice on the nori, starting with the side closet to you. Cover up until about 3 inches from the end farthest from you. Keeping your fingers wet will prevent the rice from sticking to your hands. Lay your veggie fillings on top of the rice, as shown above. Grab the wax paper on the edge closest to you and pull it up first and then (slowly) towards the opposite edge. You want it to begin to roll in on itself. Trust me, this is easier than rolling it by hand. Once you get to the edge, wet your fingers and run them along the inside edge of the nori to help the roll stick. Think of it like licking an envelope to seal it. Allow the roll to sit for a few minutes before slicing. You can also roll it in sesame seeds if you like. Slice with a very sharp knife, wiping it clean with a wet towel in between slices.